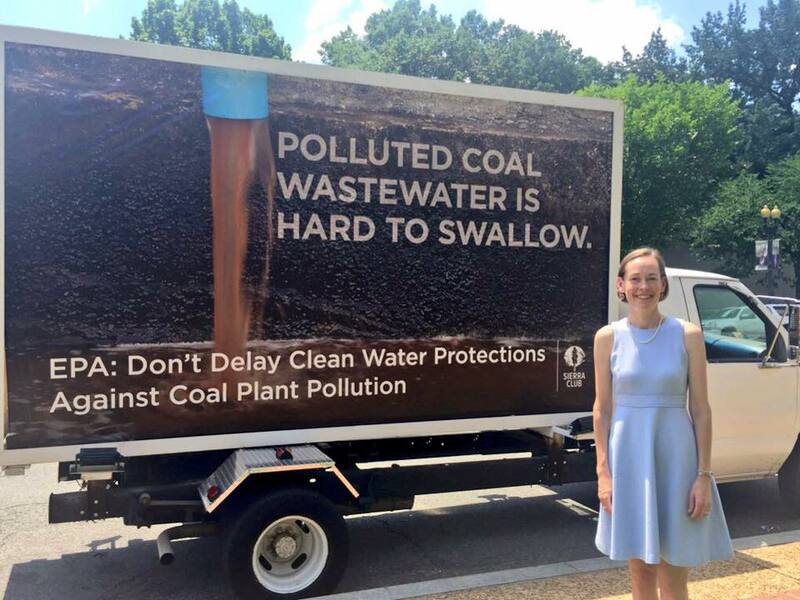 This week, I was honored to stand in Washington, D.C. alongside community and environmental leaders from 10 states to oppose Donald Trump and Scott Pruitt’s continuing efforts to weaken clean water protections against coal plant pollution. We started the day with a press conference at the National Press Club, where I called on Trump and Pruitt to “stop pandering to polluters with deep pockets and do their job of protecting local water supplies from industrial coal sludge that is spewing out of power plants across our country.” We then moved to EPA headquarters for a public hearing, which was dominated by people who opposed the weakening the protections. According to the EPA, coal-fired power plants are the single biggest source of toxic water pollution in this country, more than all other industrial sources combined. Every year they release millions of pounds of toxic metals like arsenic, lead, and mercury into our streams, rivers, and lakes. This poses a real and present danger to millions of Americans, because these toxins are linked to health problems ranging from cancer to birth defects, and nearly 40 percent of all coal plants dump their toxic wastewater within five miles of a downstream community’s drinking water intake. During Monday’s hearing the EPA heard first-hand from people on the receiving end of this dangerous pollution, who made long trips to Washington, DC specifically for the hearing. They called on the EPA to not delay the strengthened protections put in place back in 2015, which hadn’t been updated for more than 30 years. Scott Pruitt proposed the delay shortly after coming into office, loyally doing the bidding of his polluter buddies as heartbreaking stories flooded the EPA pleading for the new rules to stay in place. These stories were on full display this week, and they are both moving and infuriating. The public fought for these common-sense safeguards for many years, and as finalized by career scientists and policy experts at the EPA in 2015, they would reduce more than 90 percent of the toxic heavy metals that coal plants dump into bodies of water that local families use for everything from drinking water, to outdoor recreation, and fishing. Now Trump and Pruitt are forcing the EPA to do an abrupt about-face and trying to take those protections away from the American people. All through the public hearing, I heard testimony from people who made long journeys from so many places urging EPA to not delay these water standards – from Missouri, Tennessee, Alabama, North Carolina, Georgia, Illinois, New Mexico, Maryland, West Virginia, Virginia, and the Navajo Nation. Of the almost 70 people who testified, only three supported delaying the standards, and they all represented coal plant operators – the very polluters that have refused to clean up this pollution for the last three decades. Fed up, I testified as well, which you can see here. As I told the EPA panel, the Sierra Club will fight this attempt to delay and weaken these vital clean water protections every step of the way, with every tool at our disposal. This is a matter of life and death. There is no excuse for delaying and undermining these standards. People’s lives are on the line.